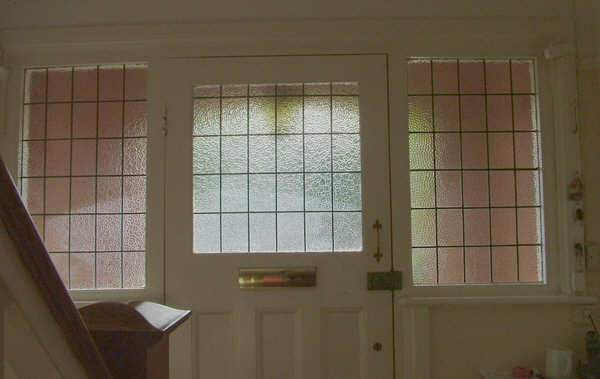 Do you have a space which would benefit and be brightened by some stained glass? Would you like to have a unique piece of fused glass built into your new extension? Whatever your ideas for glass within your home or other setting I would love to help. 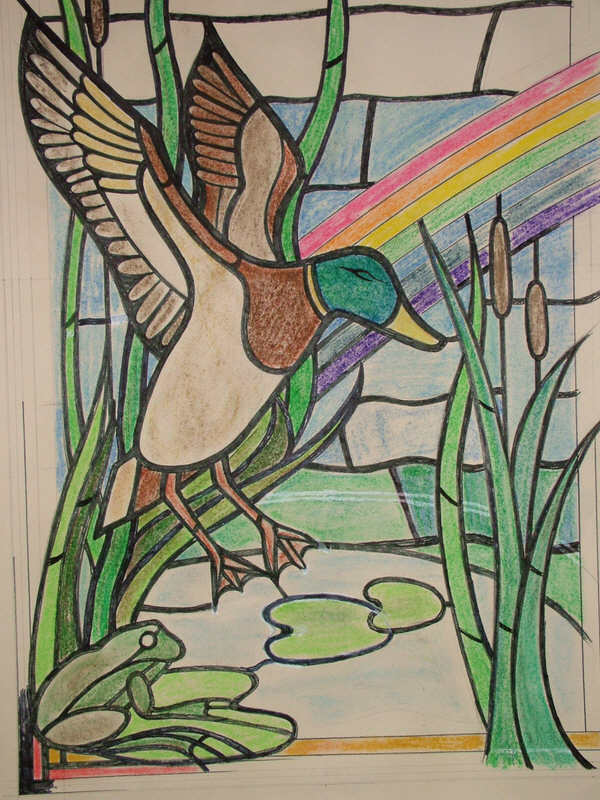 With thirty years of experience designing and making stained glass, I am sure I can help you with your project. You may have definite ideas on the style and colour you would like but equally you may not! In this case I am here to help and guide you, please phone me for a chat or email me. You may have a set budget for your glass work and I will work within that if possible. I do not have a price ‘per square metre’ as every project is unique – but I am happy to give ‘ball park’ figures to help you decide what to have. Once we have settled on an idea and rough price guide I might visit your site to take measurements and discuss colour and style. Alternatively you may prefer to come to my workshop to see and handle the glass so you can see whats available. 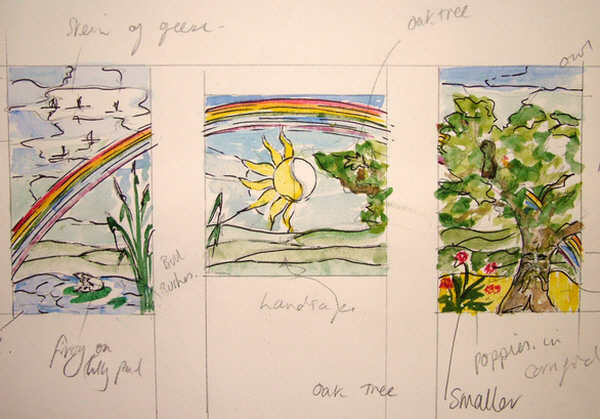 Following this visit I will produce a scale water colour design, showing all the detail and colour to be in your windows. I will send this to you along with a final quote based on this design. If you are happy with both design and quote then at this point I will require a deposit of 50%. The next step is for me to produce a full size drawing, known as a cutline for a leaded light or in the case of a stained glass window, a cartoon. I will show this to you for approval before I start manufacture. I create your glass in my studio in The Surrey Hills. You are welcome to visit to observe the process and are positively encouraged to do so. When your stained glass is finished I personally help and oversee all installations to ensure the highest standards of craftsmanship are met. Some projects are encapsulated into sealed units to comply with recent building regulations. Whatever your ideas for glass within your home or other setting, fused glass for windows, fused glass for walls, stained glass or leaded lights I would love to help. Please have a look at the images below, relating to a project to see how the design process evolves from your initial ideas to a finished piece of art glass. This is the hallway. This client felt that stained glass would brighten his days. I took this photo when I visited to discuss his requirements. At the same time I made accurate measurements – if it doesn’t fit, it’s my fault! 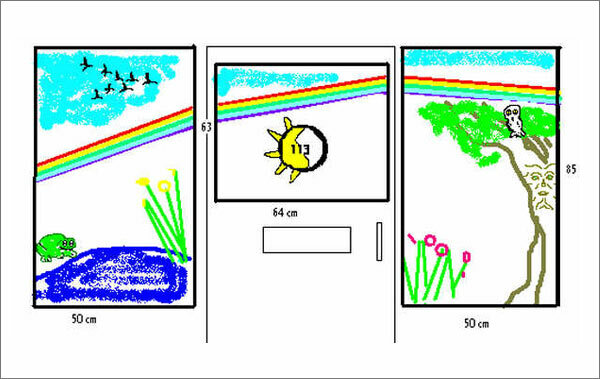 This was the initial drawing sent to me by the client supported by a written description of his requirements. Based on his original drawing, I produced an initial sketch to discuss. After discussion the design was modified and developed. After discussion with the client we made a few changes to the final cartoon. At this point we chose some glass colours and textures. Note the green man disguised in the oak tree! This is the full size version of the agreed final design including the changes. 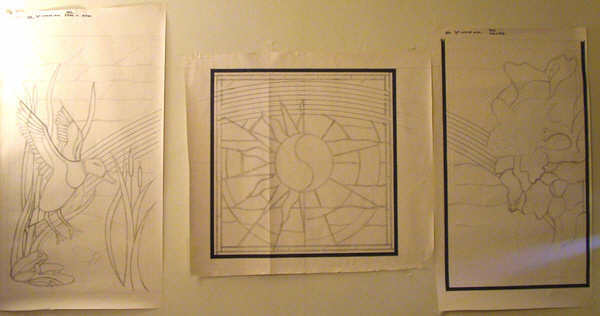 From this drawing I make a cutline which I use as a guide to cut the glass and lead the panel. I roughly colour in the full size cartoon to save referring back to the final design watercolour all the time. 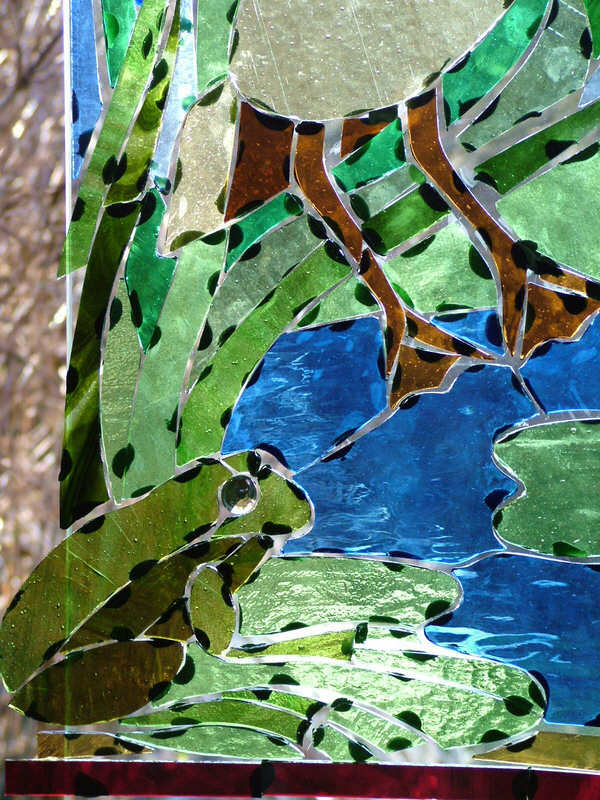 Here are the pieces of glass, cut to size from the cartoon and waiting to be connected with the leading – see the frogs eye. The dark green blobs on the pieces of glass are plasticine which I use to hold the pieces to a large plate of glass. 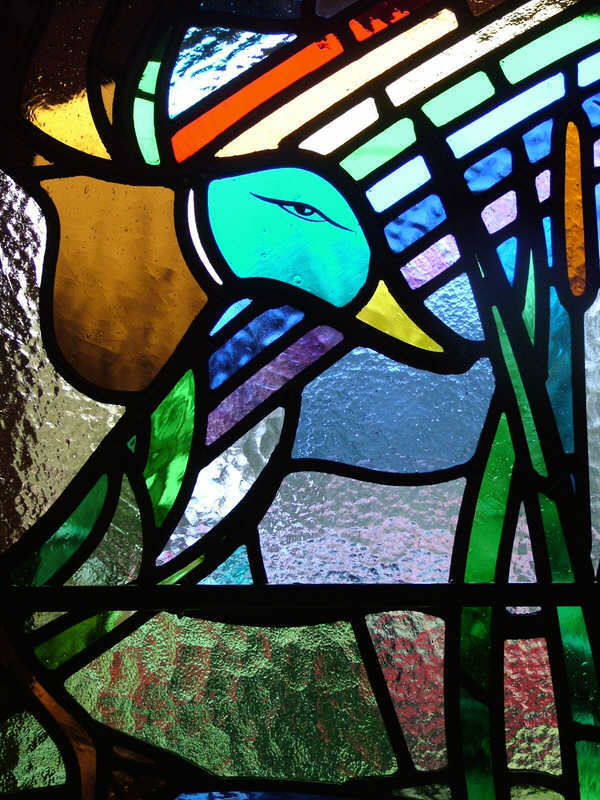 Here is a close up of the head of the duck – see the range of textures in the glass. The eye is painted on using traditional materials and methods and fired in a kiln. Here is the window finished and installed.